So hey! I am so happy and excited to be finishing up the week on high note! My week kind of started off in not the best way, but fortunately, it just got better and better each day. And I have a really great feeling that today is going to be the bestest of them all! So how did your week go? Good, bad, somewhere in-between. I’m pretty sure no matter how your week went that we can all agree that we are glad it’s Friday! My week was jam-packed, as am I am juggling just a few things right now, but it was, all in all, a pretty good one. I love when I can end the week feeling like I got a ton accomplished, and all is good. Anyone else feel the same? Plus, I’m super excited because I actually have a 4 day vacation coming up and it’s going to be so awesome. I am finally taking Asher to The Wizarding World of Harry Potter a week from Saturday. Literally we have been planning this trip for months… and pushing it back for months… BUT it’s finally happening, we are going! PS. Another reason I am beyond excited for this trip is because Asher doesn’t know that I am surprising her at the airport with two of her most favorite people! My brother Kai and his girlfriend Caitlin are flying in from LA and are going to surprise her at the airport. I am making Kai wear a Dumbledore costume and then he is going to give Asher, her official “Hogwarts Acceptance Letter“. YESS. I mean, I know it’s so dorky, but she’s going to freak out. Hoping all goes as planned! Okok, so well I could probably talk about random life things all day today (so much to share for some reason! ), but I’m not going to bore you guys to death, and will move on to talking about these scones!! Today though we shall talk scones! Do you guys remember when I made these blackberry scones? Yeah, well before those scones I’d actually never made scones… nor eaten them either. I know, craziness! Anyway, I made those scones and fell in love, so I figured a buttery fall scones was something I just needed to do. 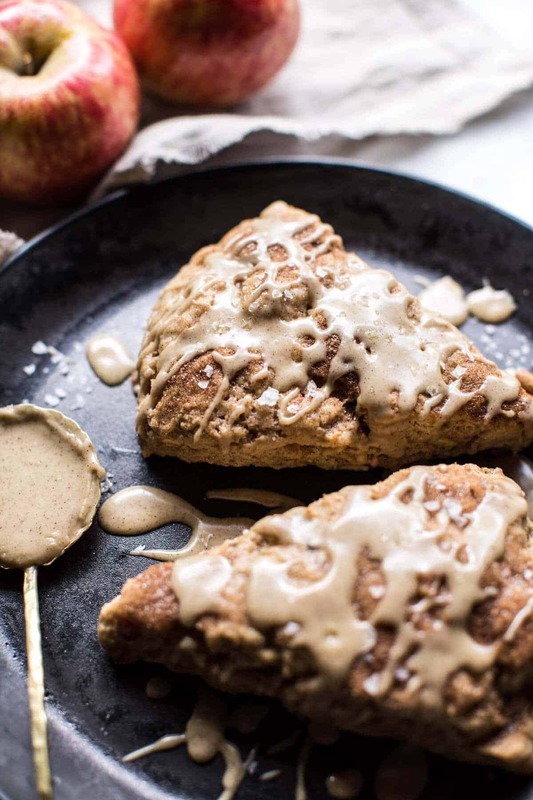 Enter these Brown Butter Maple Glazed Cinnamon Apple Scones!!! 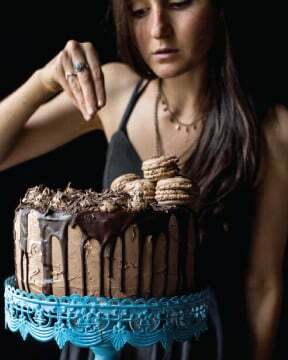 Really, all I can say is YUMMM. …brown butter? toasty, golden, warm, buttery, perfection. …maple? the perfect pairing with crisp fall apples. …cinnamon? again, can you really do a baked apple treat without cinnamon? my thinking is no. I know that I may not have had a whole lot of scones in my lifetime, but I’m declaring these a favorite, and for all the reasons listed above. They’re just beyond delicious. They’re the perfect treat to welcome in the first weekend of autumn! Oh and also…these scones are really easy too! They take just under thirty minutes to make. 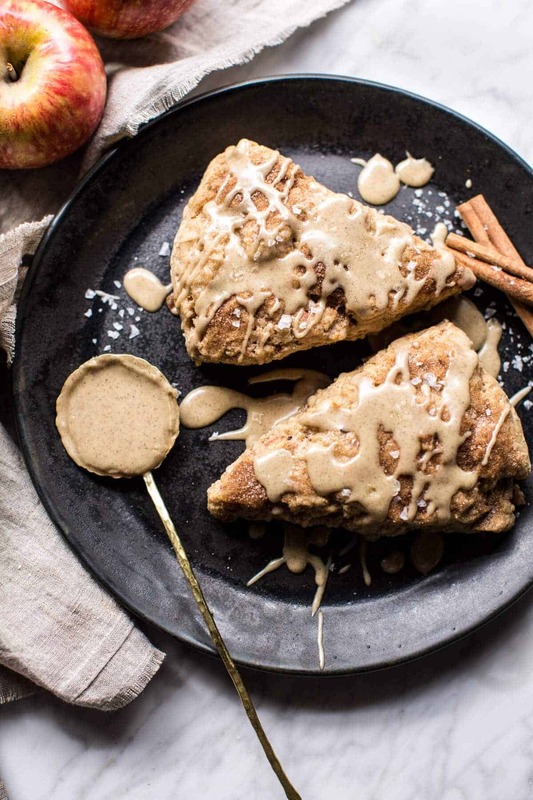 And eating them hot, right outta the oven, drizzled with a generous amount of that brown butter glaze, and then sprinkled with just a little cinnamon sugar (you know, for good measure), well it’s kind of an out of this world experience! Oh wait! I almost forgot! I’m taking over the Crate and Barrel Instagram today for Cocktail of the Week. I will be sharing four new fall inspired drink recipes along with an Instagram Story on how to make my favorite Spooky Witch’s Brew! It’s going to be fun, so come hang out with me! 🙂 ? Brown butter?,toasty, golden, warm, buttery, perfection. Maple, the perfect pairing with crisp fall apples. Cinnamon, can you really do a baked apple treat without cinnamon? my thinking is no. In a mixing bowl, combine the flour sugar, baking powder, cinnamon and salt. Add the butter and toss with the flour. Add the egg, buttermilk and vanilla. Mix until just combined, being careful not to overmix. Fold in the chopped apples. Turn the dough onto a floured surface and then pat into a 1-inch-thick circle. Cut the dough into 8 wedges. 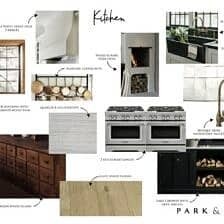 Place pieces, about 2 inches apart on the prepared baking sheets. Brush each piece with buttermilk. Bake until golden brown, 15 to 18 minutes, rotating sheets halfway through. Meanwhile, make the glaze. Add the butter to saucepan. Allow the butter to brown lightly until it smells toasted, about 2-3 minutes. Stir often, butter will foam and then settle back down. Remove from the heat and whisk in the maple syrup, powdered sugar, vanilla and a pinch of salt. 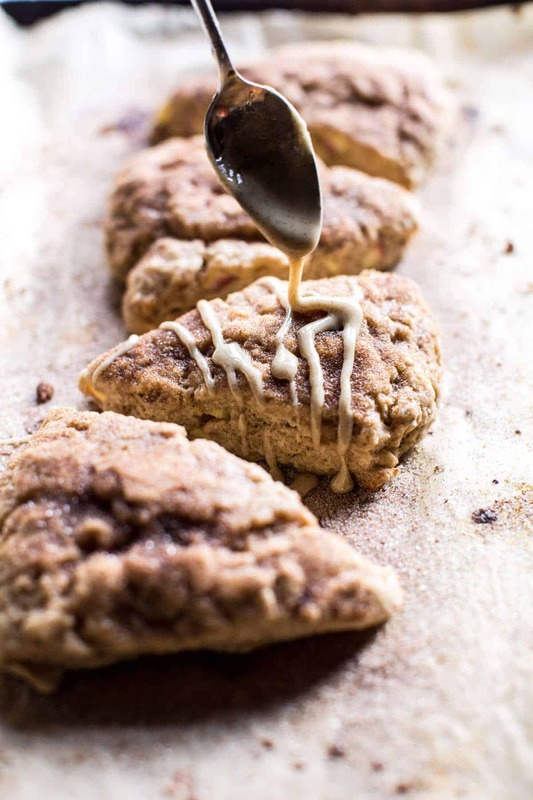 Let the scones cool slightly and then drizzle with the maple glaze and sprinkle with cinnamon sugar. Serve warm and enjoy! Have a great scone filled, first fall weekend! See ya, Sunday! 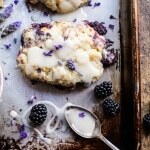 Blackberry Lavender White Chocolate Scones. These look awesome! 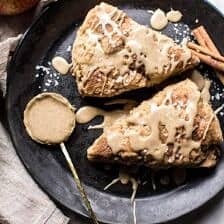 I love brown butter, just crazy about the nutty toasty flavor! Yeah I wasn’t too crazy about scones as well because it seems like the ones I’ve had were too dry so I just started liking them when I first made it last month. Definitely will try this! I just mentioned about your trip too I know it was coming up. Wow I can just imagine her freaking out with what you guys are planning! ? I hope you love these!! Thanks Sheila! So excited about the trip! Ok, first of all, YUM. Second of all…and possibly most importantly, I went to the Wizarding World on Honeymoon this year and had a BLAST, I wrote some posts on it recently if you’re looking for some tips?! Oh my gosh! This is so awesome thanks so much!! I will check those out! Thanks! These look like some serious winners! Omg, totally dying for one right now! Thanks Tori! I hope you love them! Oh my lord, these look beyond delicious!!! THat glaze alone has me salivating like mad!! Haha that is so awesome! So happy you are loving these Ruth, thanks! I love the story of your brother dressing as Dumbledore to surprise Asher! That’s going to be epic!! Take pictures please!!! And you are going to love your trip to The Wizarding World of Harry Potter!! Try the butter beer! 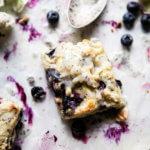 Back to this post – must make these scones ASAP they look devine! Yes I am so excited for it!! Thanks so much Kathy! I can honestly smell fall just looking at these scones. They look AMAZING! Wow this is absolutely beautiful. Fall is my favorite season and maple anything is the stuff of my dreams. Perfect!! Haha I hope you love these Jessica, thank you! I am so excited for Asher, I was almost jumping out of my chair at 5am!! And only us, Harry Potter fans can understand the significance of the certificate before the flight. It’s going to be something she is going to remember for the rest of her life!! You are one awesome sister!! Oh, and those scones are beyond amazing!! Somehow I am not all that excited about pumpkin this year ( overdid pumpkin last 4 years :-), but I am all about APPLES!! Awh thank you! I really hope she loves it and enjoys herself! 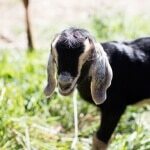 So happy you are pumped about apples cause I am too! Lol! Thanks again Nikki! Thanks for the tips! I will have to pass this along to the fam so we can all enjoy! Thanks so much Andrea! Oh my gosh I hope you snap some photos of your brother and Dumbledore and Asher’s reaction. What a great idea and what a guy! So sweet. I am so so pale too and have been trying different self tanners for years. My current go-to and favorite is the original St. Moriz. I think it works better than its more expensive competitors. Vita Liberata is also nice. Just be sure to buy the applicator mitt too if you try them- using bare hands is a mess! Ooo I will have to check it out! Thanks Sara! And yes I will take lots of pictures of this, I am super excited! I just made these and while the scones are great the glaze is awesome. I think that I just found my new favorite glaze for all kinds of baked goods. I make an applesauce cake that this would be fantastic over. I can’t wait to try it! Yay! This is so awesome and I am so happy you love these! Oh and you will have to tell me how the glaze tastes with the applesauce cake!! Thanks Buffy! Awh thank you so much! I am super excited! I LOVE all these maple syrup recipes ! I’m canadian, so obviously maple syrup is like a BIG thing that I use is most recipe. I’m always glad to see new ways to use it !! Awh thanks so much Erika! Just want her to have a great time!! I hope you love the scones! Yum, I’m going to give this a try, thanks for the wonderful suggestion. Awesome!! Hope you love it Charlie! Apples and cinnamon are so good! Agreed!! Thanks so much Charlotte! Oh awesome! Thanks so much Elana!! I really want to try these with whole wheat flour…thoughts??!?! YAY! I hope you love them, thank you Laura! Made these for breakfast Sunday, and YUM. I love that the scones themselves aren’t too sweet, just perfectly spiced. 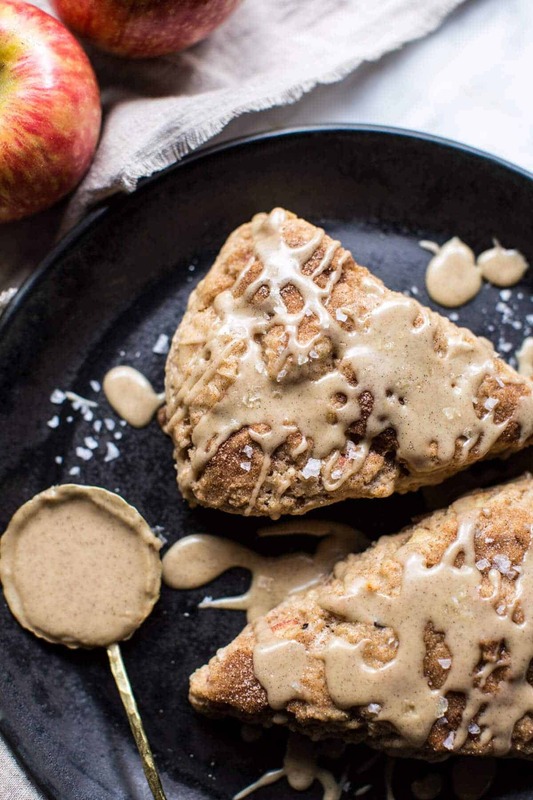 They actually reminded me of apple pie…apples, obviously…sweet, gooey glaze…warm fall spices…buttery scone standing in for pie crust…you might have just tricked me into dessert for breakfast and I love love love it! Awh that sounds amazing!! Thanks so much Alexandra! Made these last night and have to say they are delicious! A few questions / comments: before the scones cook, you say brush with buttermilk — should the recipe say “then sprinkle with cinnamon sugar”? I felt like that might have worked better. The glaze IS absolutely delicious, but wondering if it ever will set. I made the scones last night and the glaze this morning (to bring to work) and the glaze stayed rather liquidy. It didn’t matter for taste, but for presentation, they would have looked so nice if they glaze hardened. I made these on Saturday and all I can say is wow! 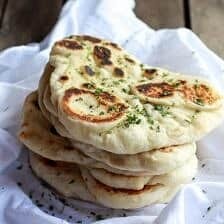 They are so quick, easy, and delish. The glaze didn’t really thicken like yours did but they were still incredibly tasty! My fiance devoured them. Can’t wait to make them again! Always love hear there was a devouring! Haha! So happy you guys liked them, thank you!! These look so freaking tasty! With all those fall flavors too…mmmm! 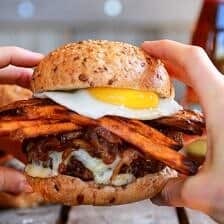 Checking this recipe out this weekend for sure! YAY Hope you love it Jessie!! You left me hungry right now. Looks delicious!! Just tried these… They’re delicious, but I think I did too much buttermilk over the tops since mine were definitely cooked through but didn’t get golden brown on top. Also, my glaze wasn’t nearly as opaque as the gorgeousness in the recipe photos (too much maple syrup?) I think the instruction of grating the butter was a great way to incorporate it, and I’m going to definitely use it in other situations, but my butter melted pretty quickly into clumps inside my grater while I was getting the rest mixed up. I should have let it sit in the freezer before grating. I guess I’ll have to try again! Yum hahaha. I posted my sort-of success on Instagram! I usually find scones to be too dry and crumbly, but these were just right. Made these for Sunday breakfast following Thanksgiving. Delicious! Great with out without the glaze and so moist! Thanks for another great recipe! Thank you Keri! I am thrilled these turned out so yummy for you!! I’ve never been a huge scone person because I always thought the texture was too dry. Have to say though, these scones look incredibly beautiful! The glaze is absolutely fantastic! 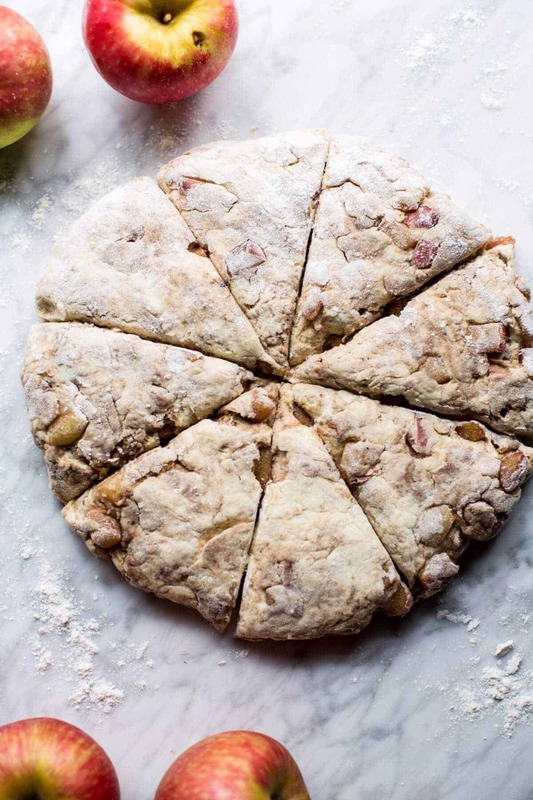 Went searching for apple recipes on your site and came across these. They are delicious! I got a huge thumbs up from the after school crowd! Happy to hear that!! Thank you Maura! Hmm, how much of the cinnamon sugar did you use? There’s no number before cup or unit of measure after 1/4. 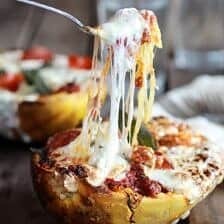 Dying to make these for fall and would love to get them right 😉 They look incredible! Thanks!! Hi! I just like to use the cinnamon sugar to taste, so sprinkle some one, taste and add more if desired. Hope that makes sense. Let me know if you have other questions. Thank you! 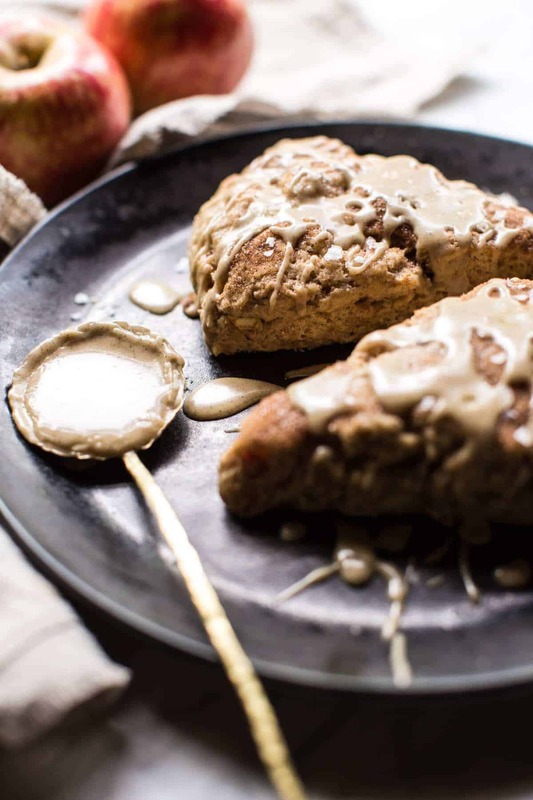 I’ve been on an apple kick and want to bake everything with apples. Made these today and they are SO GOOD. I used 1 cup of whole wheat pastry flour and 1 1/2 cups all purpose flour. I brushed them with heavy cream and sprinkled them with the cinnamon sugar mixture prior to baking. I used an ice cream scoop to portion them into 10 mounds rather than patting them out and slicing them, that’s just how I prefer my scones. The icing is delicious!! My fiancé declared these are the best scones he’s ever had. They are definitely on my “to make again” list. 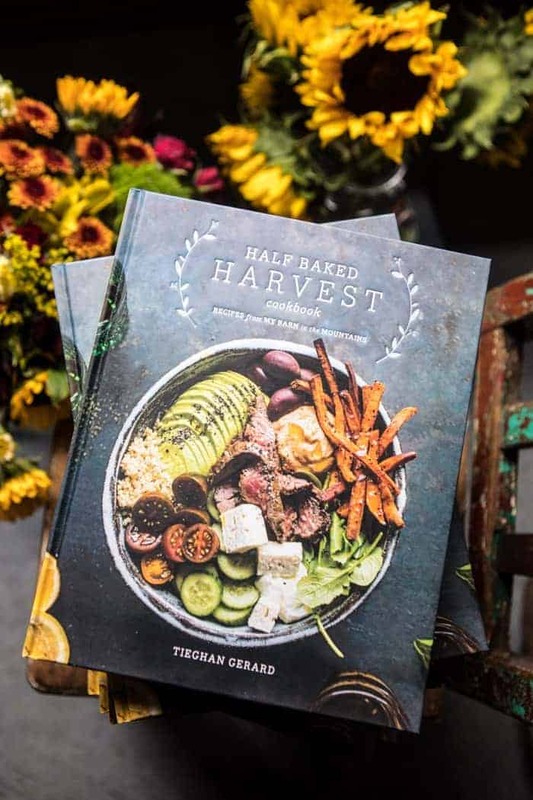 Thanks for the lovely fall recipe! Thank you Natalie! I am thrilled you and your fiancé loved these.. and best scones he has ever had?! Wow! Thank you so much for this recipe! 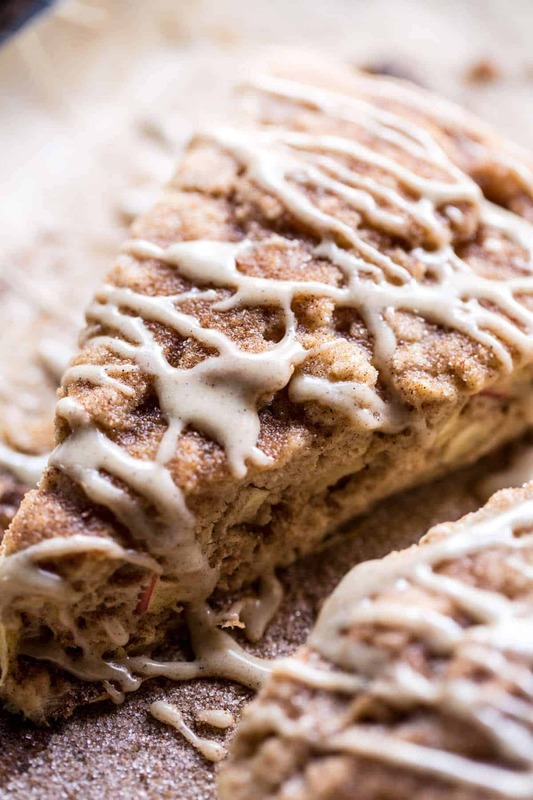 Was looking for a cinnamon scones recipe to make for a friend and these looked so good – just made them and they are so good!! 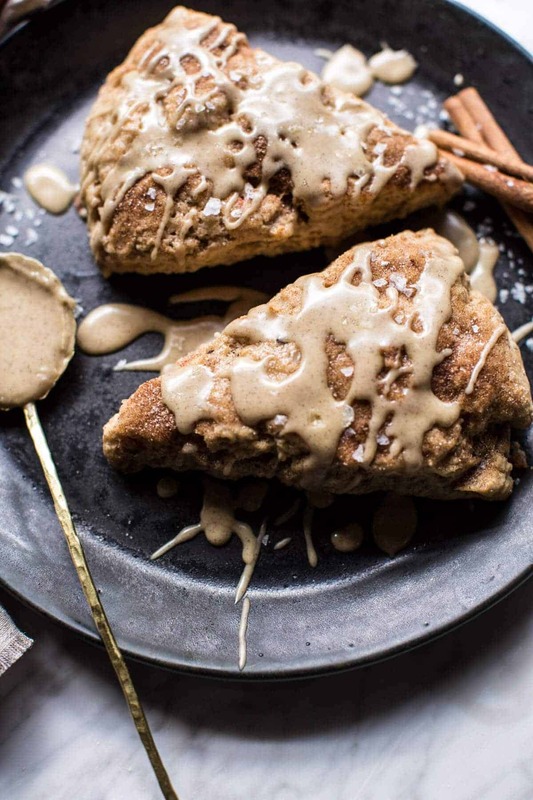 I would have loved to make the glaze you wrote in this recipe but I needed the glaze to harden so I just made a coffee-cinnamon glaze on top… and the scones are great 🙂 thank you very much! Hi Anika! I am so glad you loved these scones and I hope your friend did as well! Thank you! best scone recipe ever. love the grated butter idea. glaze is fabulous. I made these for supper tonight, with scrambled eggs, and they are some of the BEST scones I’ve ever made! Sweet enough even without the maple glaze, and sooooooooo light and fluffy! Hi Laurie! Yes, I just added you!